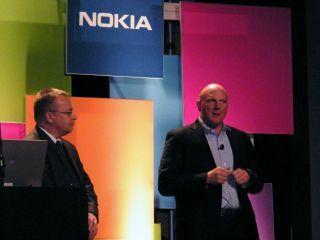 Although Nokia CEO Stephen Elop did the leg work in introducing the new Nokia Lumia 900 at today's CES 2012 Nokia press conference, a fine performance was overshadowed, not only by the handset, but by the introduction of Microsoft's Steve Ballmer. "It's been around a year since we announced the partnership with Nokia and really the whole push to build what clearly can be the strong third ecosystem in the smartphone market and with a very differentiated point of view," said Ballmer of Nokia and Windows Phone's partnership. "It's really resonating well. We have about 50,000 apps now. Nokia got off to a fast start. We didn't sign a contract to work together until less than a year ago." Elop said it was clear that Nokia had to align itself with a mobile ecosystem, hence the decision to side with Windows Phone. "We believe the industry has shifted form a battle of devices to a war of ecosystems. Across our portfolio Lumia is engaged in the heart of our strategy, and our need to engage with this war of ecosystems. Where clearly, there are strong contenders already on the field." "With Lumia, our intent has been to establish a series of beach heads in this war and we're very pleased to say that is what we're now accomplishing. You will see us push forward. There is much more that we can do." Ballmer agreed, saying it was clear there is a lot of work ahead of both companies. "We've got a lot of room to go in selling Windows Phones. The Lumia 900 represents another incredibly important milestone. 4G and LTE are absolutely crucial at this stage for North America. "When you pick up and touch and feel and love your Lumia you will find a brilliant screen…it really is a fantastic system. AT&T have sold more Windows Phones than anybody and I feel very much like the work that Nokia is doing and we're doing around Windows Phone and this third ecosystem is really going to pay off."